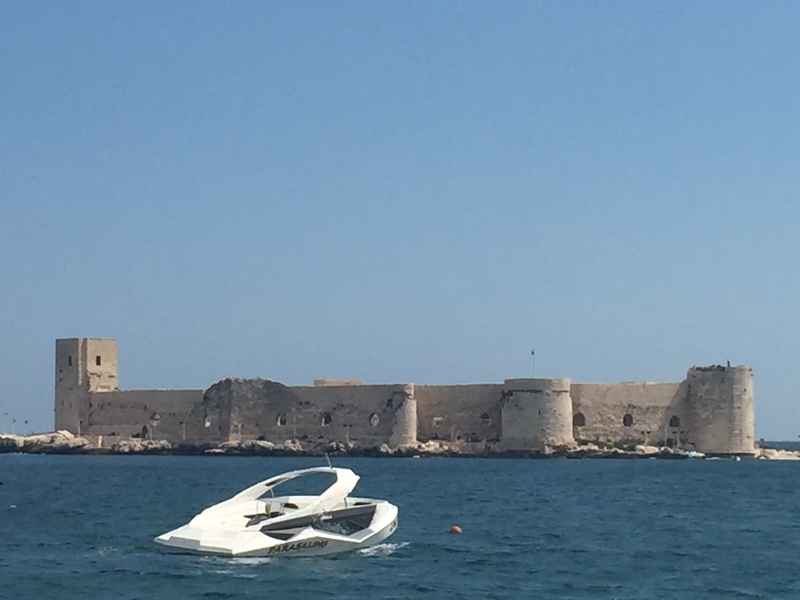 Every day in Mersin is an unpredictable adventure, and this weekend was no exception. We became best friends with our driver, survived a boat malfunction in the middle of the sea in beanbag chairs, made friends with a dog named Sandy, danced on the beach late Saturday night and struggled to get a very catchy song out of our heads. This weekend, in honor of Kitti’s arrival, we planned a trip to Kizkalesi, which is a castle in the sea about an hour from where we live. As the legend has it, the castle was built to protect a princess who was prophesied to be killed by a poisonous snake. In order to save her, her father build a castle in the sea so that no snakes could reach her. Unfortunately, one day, a snake snuck into a basket of grapes that was sent to the island from the mainland and killed her anyway. From this we learned that sometimes, you can’t avoid the things that are meant to happen, and in spite of our big plans, we just weren’t meant to go parasailing this weekend. In fact, the wind was so strong that we had to wait an hour (relaxing on the beach) for the winds to die down enough for us to go to the castle. At the castled, we found beautiful ancient mosaics, impeccable views of the sea and the mainland and the unrestricted opportunity to climb on the top of the castle. We spent awhile wandering around the roof and even climbed part way up the flagpole to get the best possible view. Kitti watched us from the castle tower, thinking that standing on the roof was enough of an adventure, but she hadn’t seen anything yet! We returned to the dock to find that the boat the promised to wait for us had left, and, not knowing when the next boat would be back, we talked about what we would need to survive on the castle island for the next year. A boat did eventually come back to get us…beanbag chairs and all! However, it only made it about 100 meters before it broke down in the middle of the sea. It was a windy day with a choppy sea and we slid around in our beanbag chairs while the boat rocked back and forth. Finally, after what felt like forever, another boat came to rescue us, but because of the structures of the two boats (one named Albatross Club and the other named Albatross Clup), we had to climb through the slats of one boat to reach the other, while rocking up and down. Timing our jumps from the first boat to the second was a true art as we waited for the waves to align the edges, but eventually we made it and made it back to shore. Even after the uncertainty of our survival at sea, there is nothing we love more than the sea, and so, in the evening, we headed down to the beach for nighttime swimming. 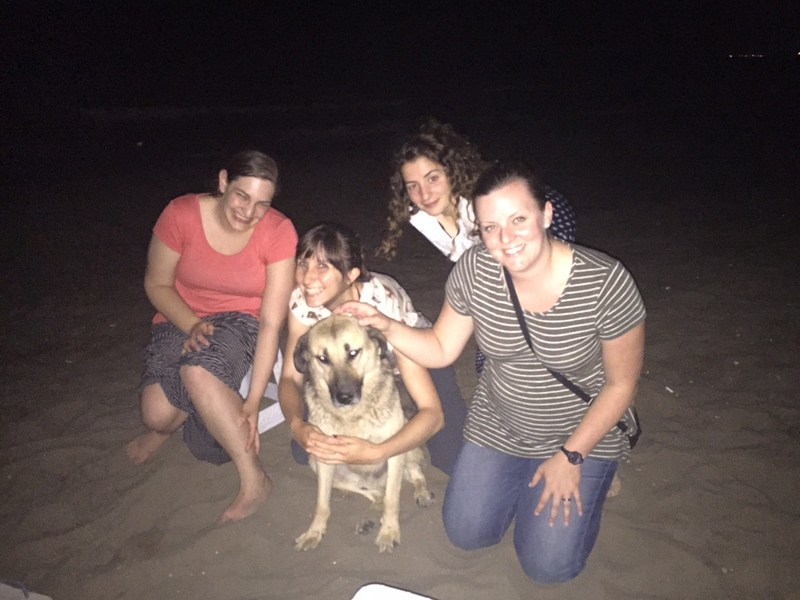 Unexpectedly, we made friends with a dog named Sandy who spend the entire evening with us and then followed us most of the way home. Distracted by Sandy, we abandoned our swimming plans and danced on the beach instead. We started with our traditional “gene dance” and then experimented with dance moves until it was 1a.m. and our phones ran out of battery to play the music. Of course, Amal and Hana wanted coffee at that time (why not stay up all night?) and so we went to a Syrian coffee shop before heading home. We took Sunday to recover from Saturday’s endless adventures and spent the day relaxing, reading our books, walking on the beach and preparing for Monday’s training. Yet again, we had the perfect weekend. Next postTell Me What You Want, What You Really Really Want!